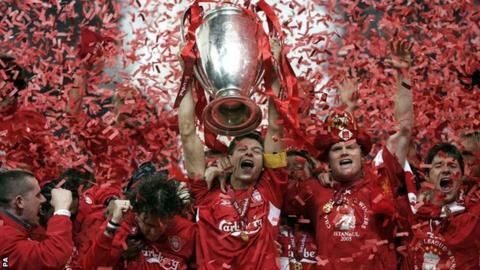 Liverpool, winners in 2005, return to the Champions League for the first time in five years. Five-time winners Liverpool will face defending champions Real Madrid on their return to the Champions League. Liverpool, back after a five-year absence, have also been drawn alongside Basel and Ludogorets of Bulgaria. Manchester City will play Bayern Munich for the third time in four seasons, as well as CSKA Moscow and Roma. Arsenal face Borussia Dortmund for the second season running, while Chelsea look to have a kind draw against Schalke, Sporting Lisbon and Maribor. "Jose Mourinho texted me to say he was happy. Would you rather be in the groups with the other English clubs? You have got to be happy with that," said Chelsea club secretary David Barnard. The Gunners, who qualified for the group stages for the 17th season in a row by beating Besiktas 1-0 on aggregate in the play-off, have also been drawn with Galatasaray and Anderlecht in Group D.
Arsenal's club secretary David Miles said: "We know Borussia Dortmund well of course, and we are looking forward to it and hopefully can progress through this group - with the pre-requisite being to aim to finish top of the group." As well as Bayern, Premier League champions City also played CSKA Moscow in last season's competition, winning home and away to help them advance to the last 16, where they were beaten 4-1 on aggregate by Barcelona. Manchester City's director of football Txiki Begiristain said: "I think this is the toughest group. Last season Bayern were first, we were second and we also played CSKA, but the fourth one was very tough, a very strong team in Roma. All the clubs try to play good football." Liverpool won their third European club title by beating Real Madrid 1-0 in the 1981 final in Paris thanks to an Alan Kennedy goal and manager Brendan Rodgers is delighted to be playing the record 10-time winners of the competition again. "Liverpool fans still recall the 5-0 aggregate win over Real Madrid - 4-0 at Anfield - in 2009 but that was against a fading side under former Spurs coach Juande Ramos and Rafa Benitez's side boasted a wealth of European experience. It may be a stretch to see Brendan Rodgers' side topping the group ahead of the holders but there is every reason for optimism that they can progress to the knockout phase." "To be back in it again, no matter who we were going to play, it was always going to be exciting. But to have Real Madrid in your group, the champions last season, is going to be special," Rodgers told Liverpool's website. "I'm already thinking of Anfield on that night. But there are two other good teams in it along with us. It's a tough group but we'll really look forward to the challenge of getting out of the group." Reds chief executive Ian Ayre added: "Is it going to be tough? Of course, but we wouldn't be in it if it wasn't difficult, fun and challenging and we have prepared ourselves well and have good preparations. "It's an exciting group, it's our competition, we're five-times winners and big nights against teams like Real Madrid is what it's all about." Real Madrid's former Manchester United forward Cristiano Ronaldo won the Uefa Best Player in Europe Award at the draw in Monaco, beating Bayern Munich pair Manuel Neuer and Arjen Robben, who were also short-listed. Ronaldo said of the Liverpool clash: "It'll be nice, I've never played there for Real Madrid. Liverpool is a very, very difficult stadium. But we are Real Madrid so we're going to try to win. "Liverpool are a fantastic team. They came very close last year to winning the Premier League. But in general the group is nice and it's going to be good for Real Madrid."